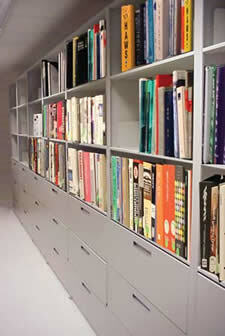 What do you get when you blend the strength of Aurora Shelving with the beauty of real wood? Wood-Tek, of course. 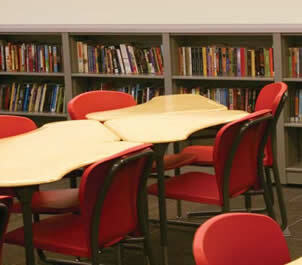 Elegant shelving, cabinets, conference tables, or custom pieces can be ordered in two species of wood and four beautiful stains. Optional custom stains are available. Choose from traditional to contemporary styles. 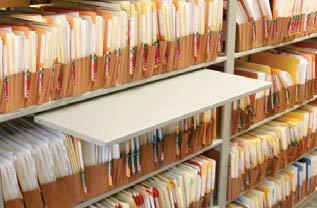 Make no mistake, Aurora Shelving is the original standard by which others are measured. Why settle for anything else? 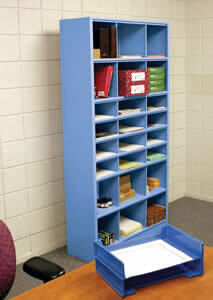 Open or closed back, single or double entry, letter or legal, Aurora Shelving has the size, style, and accessories for storing everything. 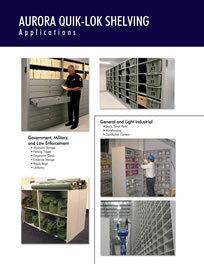 Aurora Quik-Lok Shelving can be ordered “mobile ready” to install on Aurora Mobile system carriages. 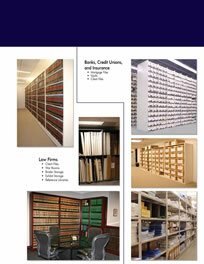 Look in universities, schools, law offices and libraries nationwide and you’ll find Aurora Library Shelving. 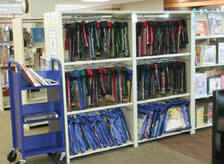 The unique inner wall construction of Aurora Library Shelving allows easy access to even tightly packed books at the end of a row. 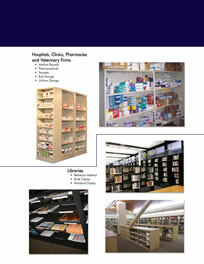 For over 50 years Aurora has been offering the highest quality, versatile shelving that assembles in a snap, no hardware required. 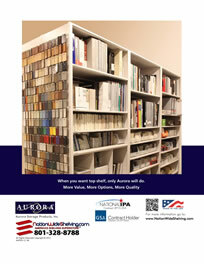 If you want more value, more options, and more quality, turn to Aurora. When you want top shelf, only Aurora will do. 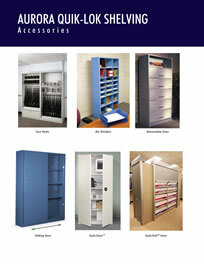 More Value, More Options, More Quality! 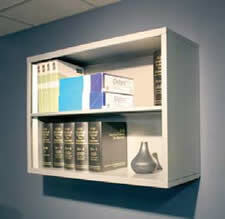 Aurora Shelving is a great value, lasting for years. A limited lifetime warranty is our value pledge. 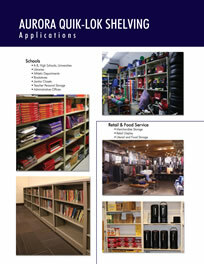 Choose from a multitude of options, now or when your needs change. 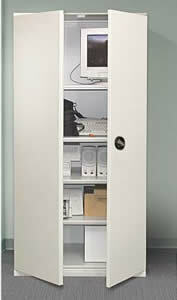 Perfect fit and perfect finish define our quality. 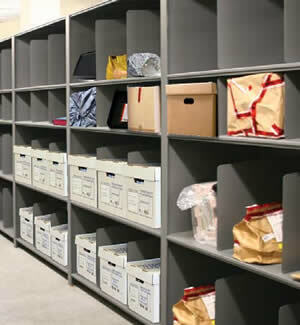 Try storing binders, computer equipment, retail goods, or product samples in lateral cabinets. 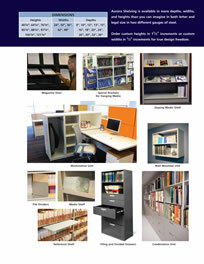 Aurora Shelving is versatile enough for anything you want to store. 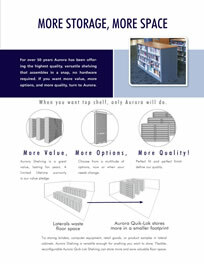 Flexible, reconfigurable Aurora Quik-Lok Shelving can store more and save valuable floor space. 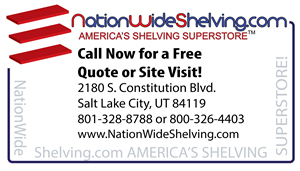 Aurora Shelving is available in more depths, widths, and heights than you can imagine in both letter and legal size in two different gauges of steel. 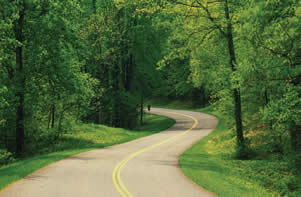 Order custom heights in 11/2” increments or custom widths in 1/2” increments for true design freedom. 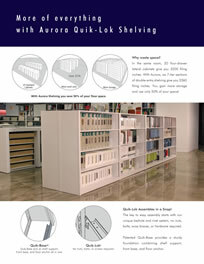 With Aurora Shelving you save 50% of your floor space. 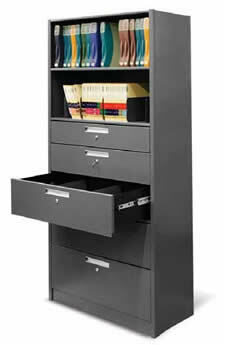 In the same room, 20 four-drawer lateral cabinets give you 3200 filing inches. 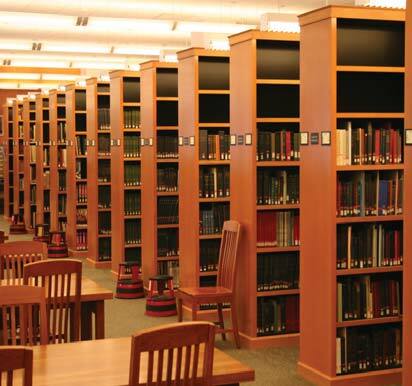 With Aurora, six 7-tier sections of double-entry shelving give you 3360 filing inches. 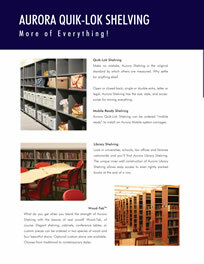 You gain more storage and use only 50% of your space! Quik-Lok Assembles in a Snap! The key to easy assembly starts with our unique keyhole and rivet system, no nuts, bolts, sway braces, or hardware required. 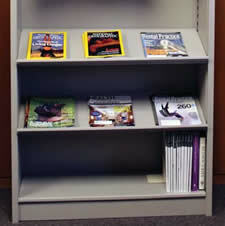 Patented Quik-Base provides a sturdy foundation combining shelf support, front base, and floor anchor. 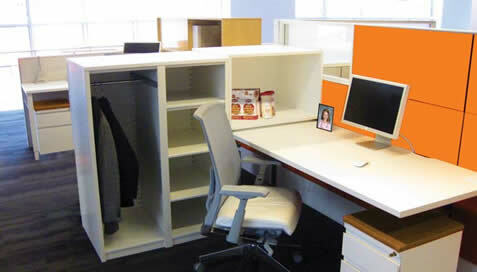 Quik-Base acts as shelf support, front base, and floor anchor all in one. No nuts, bolts, or screws required. 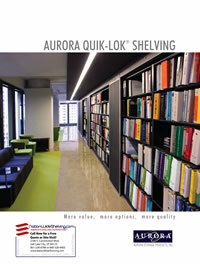 All the features of Aurora Quik-Lok Shelving come together to give you a galaxy of choices. 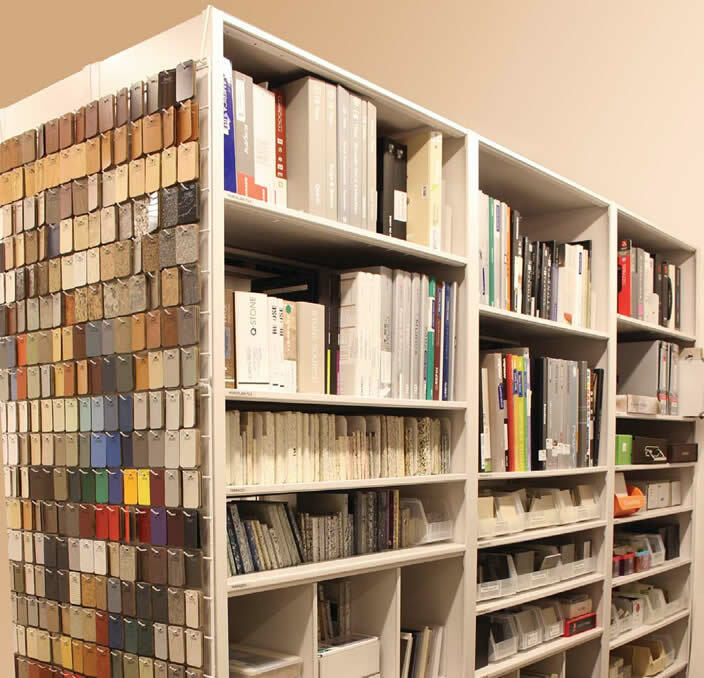 Aurora Quik-Lok Shelving is available in a variety of finishes, ranging from 32 elegant colors to unlimited custom colors, to create the look you want, or to blend with the space you already have. 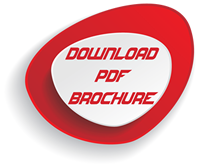 Eight beautiful colors are offered for quick ship on the Xpress program. 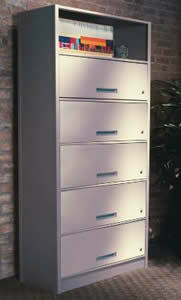 End panel options include steel, laminate, and Wood-Tek. 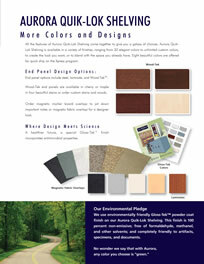 Wood-Tek end panels are available in cherry or maple in four beautiful stains or order custom stains and woods. 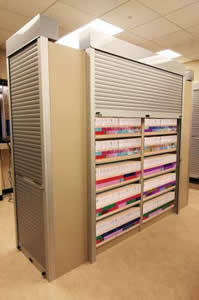 Order magnetic marker board overlays to jot down important notes or magnetic fabric overlays for a designer look. 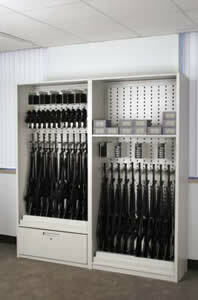 We use environmentally friendly Gloss-Tek powder coat finish on our Aurora Quik-Lok Shelving. 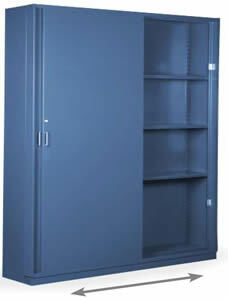 This finish is 100 percent non-emissive; free of formaldehyde, methanol, and other solvents; and completely friendly to artifacts, specimens, and documents.